Tyrone Harris, Jr., 18, who his father says was “very close” to Michael Brown, 18, lies critically wounded by cops on ground one year to the day after Brown’s death, Aug. 9, 2015. The photo is eerily similar to that of Michael Brown as he lay dead on ground after being shot 8 times by cop Darren Wilson. 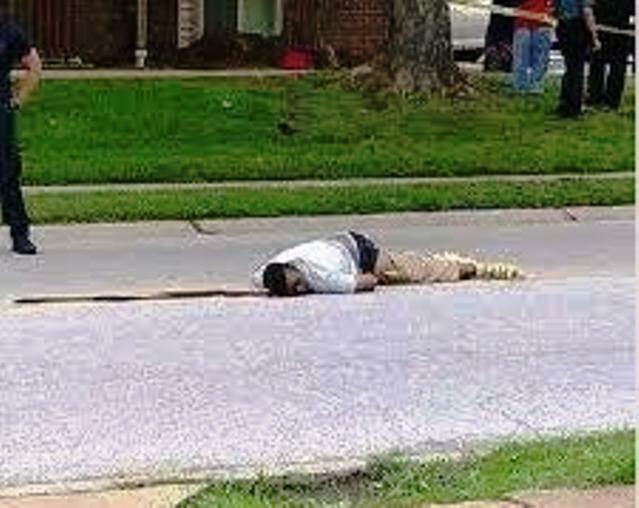 Michael Brown, 18, lies unarmed and dead in street Aug. 9, 2014, killed by cop Darren Wilson. 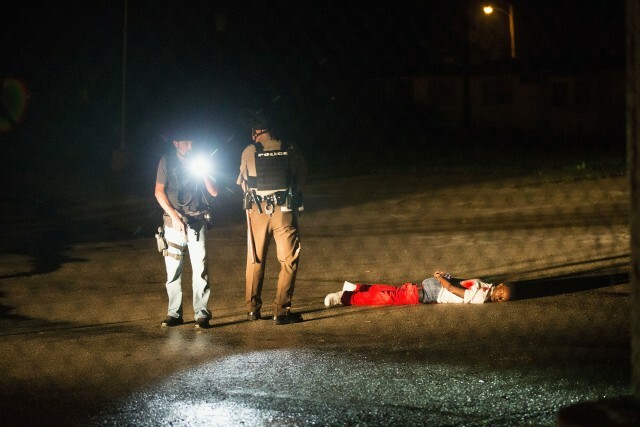 The person shot in Ferguson by a police officer after a day of commemorating the first anniversary of Michael Brown’s death has been identified by his father as 18-year-old Tyrone Harris Jr., of St. Louis, who was “real close” to Brown, the St. Louis Post-Dispatch reports. “We think there’s a lot more to this than what’s being said,” Harris Sr. said, according to the St. Louis Post-Dispatch, adding that his son had graduated from Normandy High School. Harris Sr. also added that his son had just come out of surgery early on Monday. Jon Belmar, the head of St. Louis County police, said that a man opened fire on plainclothes detectives on Sunday evening. He was then pursued and shot by officers. The police chief did not identify the suspect, but said he was in a “critical” and “unstable” condition in hospital and undergoing surgery. Belmar added that the suspect had been tracked throughout the protest as police believed he was armed. Officers allege the suspect approached the detectives who were sitting in a van and opened fire with a 9mm gun that had been stolen last year. 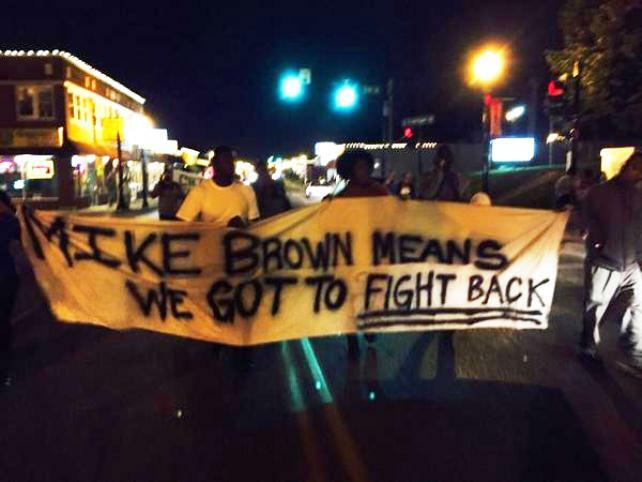 Michael Brown, Sr. heads off protest Aug. 9, 2015. The officers have all been placed on administrative leave, in keeping with standard practice after police-involved shootings. Belmar said none of the officers, who have between six and 12 years’ experience, was seriously injured. Andre Anderson, the acting head of Ferguson’s Police Department, added that several people were detained during the protests, but did not specify how many had been arrested. The gunfire occurred as Anderson was speaking to CNN about how the police, “just wanted to be as patient as possible.” As he talked, some 20 shots could clearly be heard in the background. The clip of the incident showed the police chief was shocked, as he looked away in awe when the shooting began. The head of St. Louis County police also told a news conference on Monday morning that a second shooting had occurred in Ferguson. The incident reportedly involved two groups of people on the west side of West Florissant Avenue. It happened just before police shot Harris Jr. 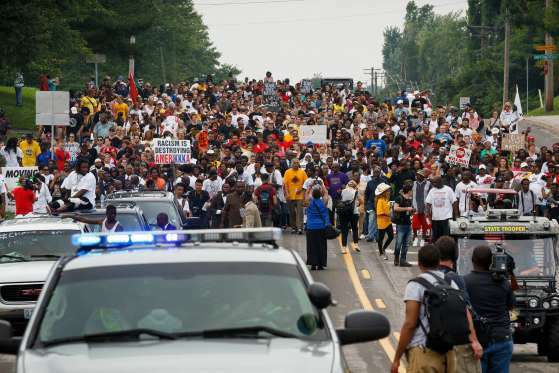 Crowds mass in streets of Ferguson to remember Michael Brown and all victims of police, 706 so far in 2015 alone. Belmar added that 40 and 50 shots were fired in an exchange between the two groups, and the incident he described as “remarkable” lasted around 45 seconds. “They were criminals. 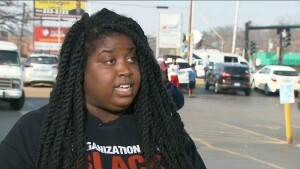 They weren’t protesters,” Belmar said of those involved in the shootings. He did not say if there were any casualties from the shooting on West Florissant Avenue. Cops manned large variety of military vehicles during protest. 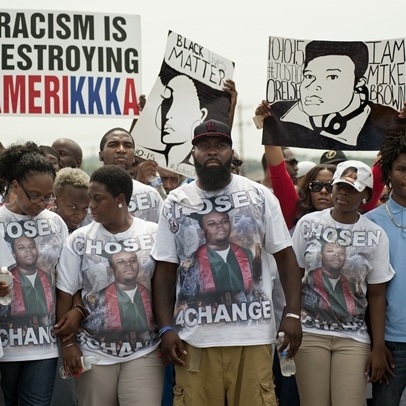 Eighteen-year-old Michael Brown was killed by Police Officer Darren Wilson on August 9, 2014. He was walking through a St. Louis suburb when he became involved in an altercation with the officer. Wilson fired approximately 12 shots from his department-issued handgun. 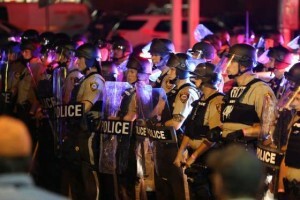 At least eight of them struck the teen’s body and two were fired at his head, despite the fact that Brown was unarmed. A grand jury and the US Department of Justice refused to prosecute Wilson, which led to riots in Ferguson and across the US, with protesters angered in their belief that justice had not been served. Ferguson, Mo. — A suspect who authorities say opened fire on officers in Ferguson, Missouri, on the anniversary of Michael Brown’s death was critically wounded when the officers shot back, St. Louis County’s police chief said early Monday. Woman collapses after hearing of shooting of Tyrone Harris, Jr. It wasn’t immediately clear if the latest police-involved shooting would spur renewed unrest in Ferguson, the site of many protests — some violent — in the aftermath of Brown’s death on Aug. 9, 2014. 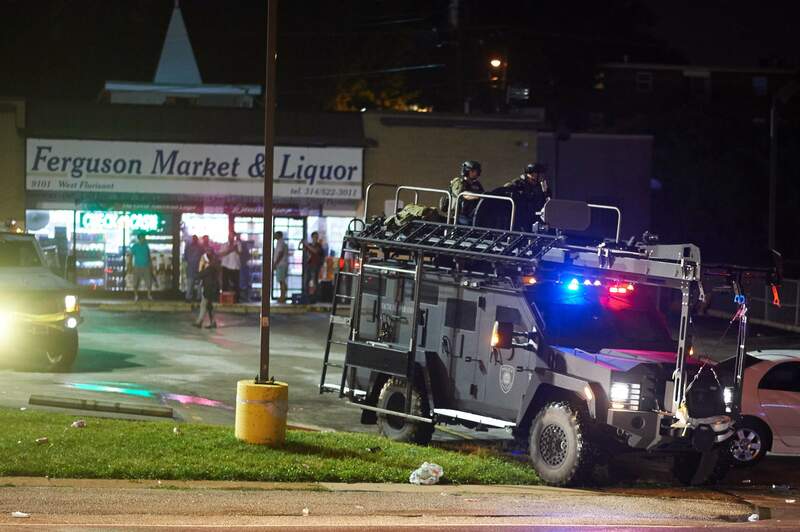 Protest groups were quick to criticize the police response to protesters who gathered along West Florissant Avenue on Sunday night. Cops in riot gear, military formation, a repeat of their actions during protests after Michael Brown’s death in 2014. 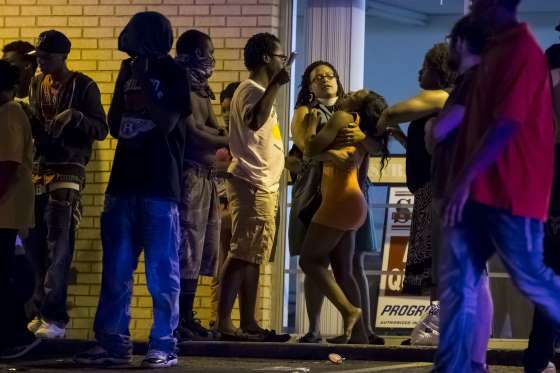 Below: Protesters in Ferguson Aug. 7, 2015 explain their rage. 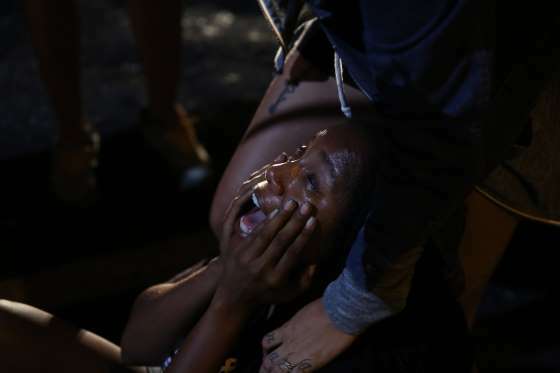 Woman after being tear-gassed by police during Ferguson anniversary protest. 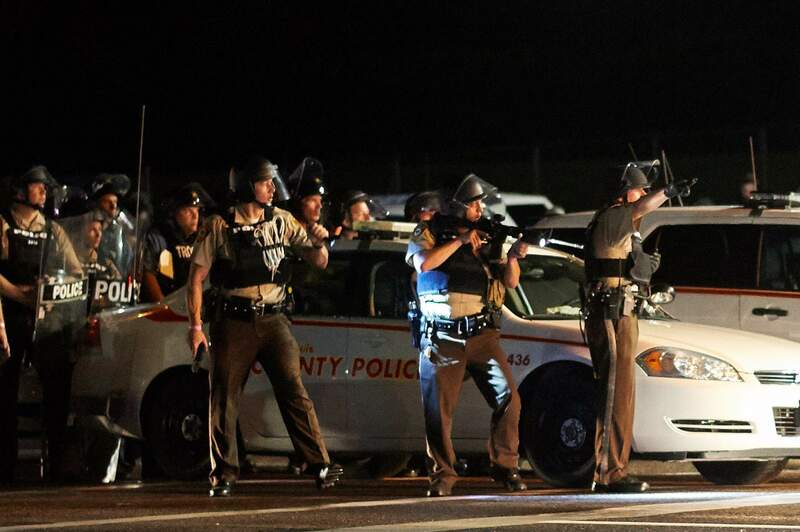 St. Louis County police, taking cover, were part of large contingent called to Ferguson. Protest last year: Mike Brown means we got to fight back. This entry was posted in Uncategorized and tagged Beatbackthebullies, blacklivesmatter, blacklivesmatterDetroit, ChristianTaylor, EricGarner, Ferguson, HandsUpDon, ICan, JamesBoyd, JoyceCurnell, KindraChapman, MichaelBrown, MikeBrown, PoliceBrutality, PoliceState, PrisonNation, RalkinaJones, RaynetteTurner, SamuelDubose, SandraBland, Sandyspeaks, StopPoliceBrutality, StopPoliceKillings, StopWaronBlackAmerica, TrayvonMartin, TyroneHarris. Bookmark the permalink.